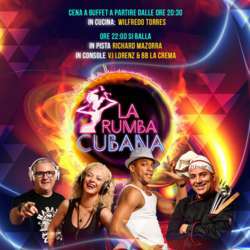 You must be a member of the Milan Cubaneando Group to attend this activity. Would you like to join this group? Please BOOK calling or texting me at Protected content so I can arrange for a table where we can be together. I propose you a very nice salsa night at Protected content an elegant and cozy spot in Milano near Naviglio Grande, that you can easily reach with tram 2 (capolinea Negrelli). If you want to come early, at 20.30, we can have a wonderful Cuban - Italian buffet dinner. I guarantee, the chef is amazing and you will eat a lot! Also, there are many vegetarian / vegan options. so I can arrange for a table where we can be together. MentionProtected content at the entrance so they can show you where the table is. At 22.00 the dancing night begins... and you won’t be able to keep your feet down, believe me! 100% Cuban salsa (also known as Timba), bachata (to rest a minute!) and reggaeton till the end. After dinner, entrance with 1 drink at your choice Protected content . Pasta is free for everyone at 1.30. It’s a wonderful evening, you will have so much fun if you like dancing Cuban music. There’s a wonderful animation with Cuban dancers and lots of very very nice people. I wait for you on Saturday night!